Potatoes. They are the perfect food for breakfast, lunch, or dinner. They can be baked, fried, or cooked numerous other ways. They work for a side dish and even a main dish. 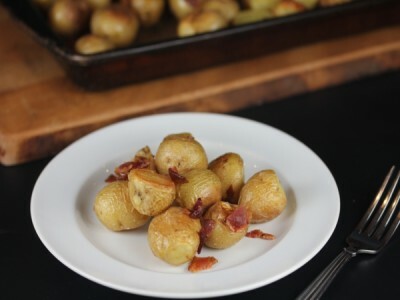 Potatoes may be one of the most versatile and delicious foods you can serve. And really who doesn’t like potatoes?! I think almost everyone likes them served one way or another. 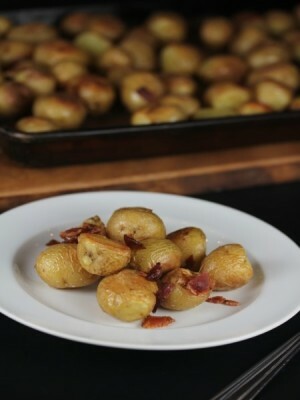 These roasted potatoes I am sharing today are so very good. Slightly crispy on the outside, yet soft and buttery on the inside. I usually serve roasted potatoes as a side dish, but when my husband and son were gone recently, my daughters and I ate them for dinner. We thought they made a great dinner all on their own because we added some cooked bacon to them. You can easily add seasoning or herbs to these, but we like to keep them pretty simple. If you have never had potatoes cooked like this you need to. Really you do. They are delicious! 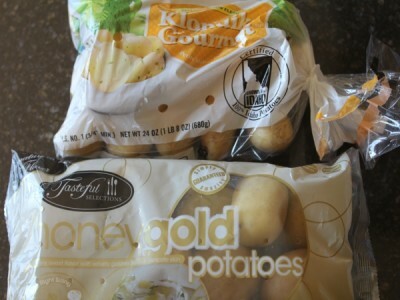 And these work with baby potatoes, the small gold ones like pictured above, fingerling potatoes, and even regular gold potatoes cut up. If needed cut some potatoes in half to make them similar in size. Add oil, salt. and garlic. Stir to coat potatoes. 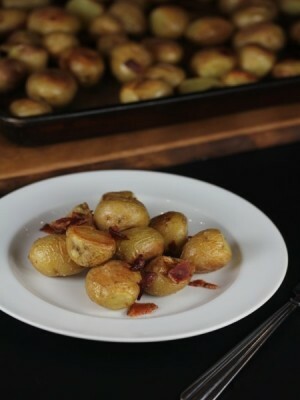 Spread potatoes onto a cookie sheet or oven safe pan. Bake for 30-40 minutes or until potatoes are tender. This make take longer depending on the size of your potatoes. During the last 5 or so minutes of cooking sprinkle with bacon. Finish cooking and serve.